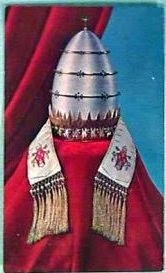 papal tiara on 13 November 1964 during the Second Vatican Council. Today is the 50th Anniversary of the fateful day Blessed Paul VI renounced the papal tiara. This momentous day was one year and twenty five days before the Second Vatican Council ended. Paul VI announced officially he was giving up his coronation crown as a gift to the poor. This was done ostensibly to help the world fund a drive to fight poverty. 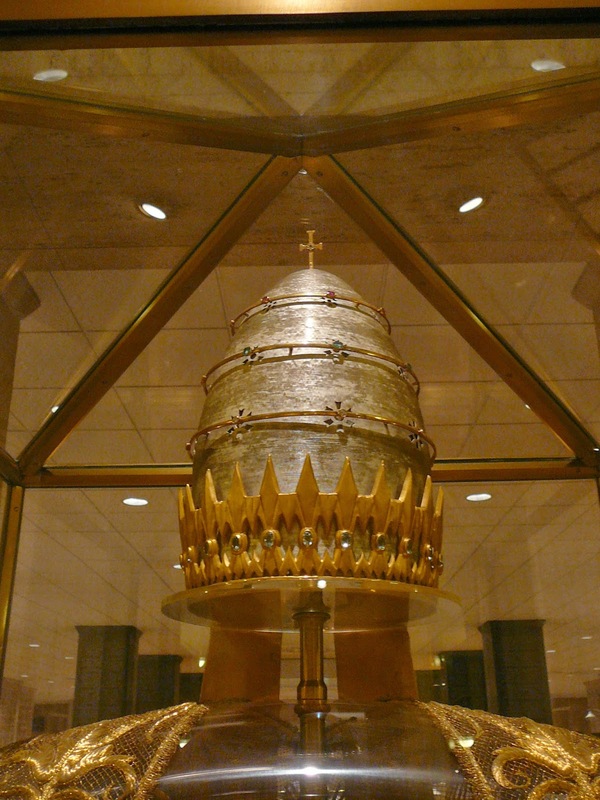 The triple tiara was a gift to Paul VI from the people of Milan where Paul VI had served as archbishop and was valued (in 1964 US Dollars) at $12,000. It weighs 3 lbs and is made of gold, silver, and studded with jewels. The tiara resembles a bullet. Paul VI's action took place at the end of Byzantine Hierarchical Liturgy he had celebrated in St. Peters. This liturgy was taking place because Paul VI wanted to stress the unity between eastern and western Catholics. As can be seen in the video below, Paul VI abandoned his tiara on the altar as a symbolic gesture which spoke volumes. "Long live the Pope of poverty!" 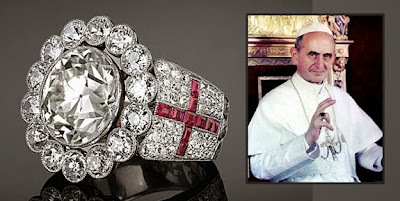 Vatican spokespeople also said that Paul VI intended the abandonment of the tiara as a gift to the poor. It was to be the first donation to a world collection to help the poor as suggested by two members of the Council. One James J. Norris and the other Cardinal Raul Silva Henriquez the archbishop of Santiago, Chile. Mr. James J. Norris on 5 November 1964 addressed the Council with a speech titled, World Poverty and the Christian Conscience. The speech which prompted Paul VI to action can be read below towards the end of the entry. This symbolic gesture of abandoning the tiara made such an impression on one order of religious sisters (Religious of the Sacred Heart) in the United States of America that they collected their gold rings of consecration, the only article they possessed of any monetary value, and had them melted down. Nothing like melting down one's wedding ring to Christ! After selling the gold they sent Paul VI the $20,000 they had received for them. Instead of being auctioned off as Paul VI intended, Cardinal Spellman of New York City made a private arrangement with Paul VI to bring the tiara to the United States. Publicly, Spellman said it was a gift from Paul VI to the United States for all the work its Catholics had done in helping the poor. Citing Catholic relief services which over the previous twenty years had distributed over 1.3 billion dollars of of food, clothing, and medicine. papal tiara on display in the Vatican Pavilion. After arranging for the acquisition of the tiara, Francis Cardinal Spellman said it was to be displayed in St. Patick's Cathedral in New York City for a time, then be put on display in the Vatican Pavilion at the World's Fair, before making a tour of the United States of America, after which it would be permanently displayed at the Basilica of the National Shrine of the Immaculate Conception in Washington, D.C.
A medal bearing the image of Paul VI being crowned with the Papal Tiara by the Cardinal Protodeacon, Alfredo Cardinal Ottaviani. "Paul VI was such a humble man who cared for the poor!" The Triregnum (the Papal Tiara formed by three crowns symbolizing the triple power of the Pope: father of kings, governor of the world and Vicar of Christ) from the XVIII Century, with which the bronze statue of Saint Peter is crowned every June 29th, the feast day of the Saint. Use of the Tiara, a ritual during solemn ceremonies, was abandoned during the Papacy of Paul VI. The Tiara is a headdress ending in an ogive and made of silver, and during the times of Boniface VIII two crowns were added, and from 1314 three crowns (the reason it is called the triregnum), topped by a small globe with a golden cross. Among the various interpretations, we shall mention the one that says that the three crowns represent the militant, the suffering and the triumphant Church. The shape of the Triregnum varied throughout the years. We may find it represented as more or less rounded, in some cases without the globe and the cross. At times there is a modified position of the ribbons (two ribbons with a patent cross hanging). Symbolically it is safe to say Paul VI gave up all being the father of kings, governor of the world and Vicar of Christ. What then was he Pontiff of? Why would one claim to be doing something in the name of the poor when it was detrimental to the end goal of life? To get to heaven. How do material possessions help one achieve this goal? There came to him a woman having an alabaster box of precious ointment, and poured it on his head as he was at table. And the disciples seeing it, had indignation, saying: To what purpose is this waste? For this might have been sold for much, and given to the poor. And Jesus knowing it, said to them: Why do you trouble this woman? for she hath wrought a good work upon me. For the poor you have always with you: but me you have not always. For she in pouring this ointment upon my body, hath done it for my burial. Amen I say to you, wheresoever this gospel shall be preached in the whole world, that also which she hath done, shall be told for a memory of her. Then went one of the twelve, who was called Judas Iscariot, to the chief priests,  And said to them: What will you give me, and I will deliver him unto you? But they appointed him thirty pieces of silver. Me you have not always: Viz., in a visible manner, as when conversant here on earth; and as we have the poor, whom we may daily assist and relieve. Christ said the poor shall always be among us. When he abandoned his tiara how was this helping the poor? Recall earlier that Paul VI and the Vatican said he was abandoning the Temporal Powers of the papacy. Cardinal Manning, of the First Vatican Council's "De Fide" committee which passed the decree on Papal infallibility said in a speech, which was latter written down in a pamphlet form, these prophetic words about what would happen to the Church if the Pontiff were to loose his if Temporal Power. "All I can do is to touch the mere outline of what would follow upon the dissolution, if that could be, of the Temporal Power of the Pontiffs. But first let me once for all, or rather once more for the thousandth time, sweep away the absurdity imputed to us, day by day, that we make the Temporal Power a part of Christianity, and that if it were overthrown Christianity would fall with it. This surpasses even the extravagance of controversy. We do believe, indeed, that the dissolution of the two-fold authority of the Pontiff would strike out the key stone of Christendom ; that is, of the two-fold order of Christianity and civilization which for a thousand years has sustained the commonwealth of Europe. We believe that then Christianity would stand alone, on its own divine and imperishable basis ; and that civilization without Christianity would return to the natural order, and to the spiritual death out of which Christianity raised it to life." Those words of Cardinal Manning are very cut and dry. Dear reader, doesn't this describe the whole of Europe today? As if abandonment of the tiara wasn't symbolic enough the bizarre behavior continued when on 4 October 1965 Paul VI visited the United Nations in New York City during the 4th session of the Second Vatican Council. There Paul VI said the United Nations was mankind's last hope of a universal organization which could bring about world peace! Unbelievable? Wait there's more! Paul VI then gave his papal cross and papal ring to Mr. U Than, the General Secretary of the United Nations. Why did he do this? To help the poor of course by auctioning them off! Paul VI had no more need for any of the symbols of his office! A few years after his visit to the United Nations Paul VI in 1969 promulgated the Novus Ordo Missae and suppressed the traditional Tridentine Latin Mass (one could even argue he outlawed it). This caused much confusion and consternation among the faithful. To top it all off, Paul VI then began wearing at religious ceremonies an ephod! Why he gave the tiara up and used the breast-plate of the Ephod, (a.k.a. the rational of Judgment) when Christ had superseded the old priests is beyond perplexing. Symbolically, Paul VI no longer appears as pontiff of the Catholic Church, the successor of Peter, the Vicar of Christ, but as a Levitical high priest, the successor and representative of Caiphas. 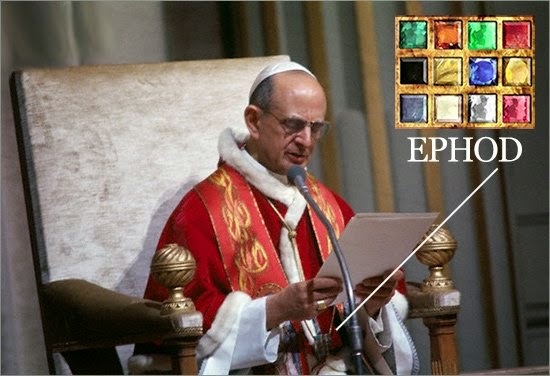 Paul VI wears an ephod the symbol of a Levitical high priest. 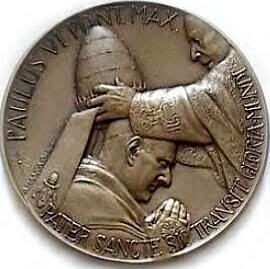 We at Call Me Jorge... have no doubt that the Blessed Paul VI will in the future be declared by Francis to be a saint. Francis like Paul VI seems hell-bent on constantly transforming everything but papal infallibility and authority. Mr. HOWARD. Mi-. Speaker, we are all aware of the very fine work done by the Catholic Relief Services-National Catholic Welfare Conference in New York. It is my great pleasure to have Mr. James J. Norris, assistant to the executive director of that organization as one of my constituents. Mr. Norris, who lives at the Avenue of Two Rivers in Rumson. N.J., is well known for the fine work he has accomplished. Mr. Speaker, on November 5, 1964, Mr. Norris gave a statement to the bishops assembled in the Vatican Council in Rome. This is historic in that for the first time in history an American layman so spoke to the bishops of the world in a council of the church. In the last decade the problem of poverty—one of the oldest and deepest that confronts the Christian conscience—has taken on a new shape, new dimensions, and new urgency. “The poor you have always with you"—yes, but today the poor are with us in a new and revolutionary context, because modern science, medicine, and technology have helped to bring about a single economy, in neighborhood that Is interdependent, but largely lacking the institutions and the policies that express solidarity, compassion, and human obligation. In this lopsided community, one small group of nations have become immensely wealthy. These nations represent 16 percent of the world's peoples, and they own 70 percent of its wealth. They are the nations grouped around the North Atlantic, which are Christian by tradition, if not always in practice. For the first time in history they foresee rising prosperity—rich today they will be richer tomorrow. Meanwhile, three-quarters of the human race live In a state of poverty bordering on or below the subsistence level. The gap between the rich and the poor is rapidly widening—side by side the rich grow richer and the poor grow poorer, in a single world community. This is a wholly unprecedented historical fact, and it presents the Christian conscience of the Western nations with a challenge, because for the first time in history it is accepted as a fact that, given time, they have the means to wipe out poverty in the rest of the world. There will be no meaning to their Christian profession or humane traditions if they forget that wealth is a trust and that property carries social obligations and that riches on the scale of the West’s modern riches must be redeemed by generosity. A number of church, private, governmental, and international agencies have been attempting to alleviate the problems of poverty and hunger in the world; nevertheless, the constantly widening gap between the rich and the poor demands now a sustained, realistic dedicated campaign to bring full Christian activity to bear upon these problems. All Christian communions are involved and therefore the opportunity is offered to all to unite in these efforts and bring Joint influence to bear to encourage governments to continue and expand their policies for providing capital and technical assistance. No other group is likely to have the staying power needed for this long, arduous and often disappointing work. World poverty will not be wiped out speedily. nor will the problem of development be solved in anything short of several generations. Our Christian peoples must not become weary of well doing. But the goal will be reached if in each wealthy country there is brought into being a strong, committed, well-informed, and courageous group of men of good will who are prepared to see world poverty as one of the great central concerns cf our time and press steadily and vocally for the policies in aid, in trade and in the transfer of skills that will lessen the widening gap between the rich and the poor. This problem is not only the concern of the wealthy nations. In our complex 20th century world, the developing nations, to progress effectively, need the capital, the knowledge, and the technical assistance of the more economically developed countries, but as wise leaders in those countries insist, the development must come from the local resources, both material and human, which God has given these lands. Recently, a bishop from one of these lands said to me, "My people live not only in poverty but in permanent misery.” Tills type of utter poverty brings with it other human sufferings. The first is hunger—a constant, gnawing hunger that is never satisfied day or night. Poverty brings diseases that cannot be cured because there are no medical services. Poverty brings illiteracy in lands where the great majority of people cannot read or write. Poverty brings bad housing slums that breed crime and sin. Poverty means that a mother looks at her newborn infant knowing that it will probably die before the year is out. For millions of people, living in this kind of poverty, death is a sweet release. A loving human family does not permit its members to suffer in this way. When all the members of our Christian family become aware of the extent of suffering and privation among the poor of the world, surely they will make certain that their wealthy lands will not fall to respond to their Christian obligation. From this ecumenical council could come a clarion call for action which would involve the creation of a structure that would devise the kind of institutions, contacts, forms of cooperation and policy, which the church can adopt, to secure full Catholic participation in the worldwide attack on poverty. This great gathering of bishops represents every continent and every country on earth. Immaculate Conception in Washington, D.C. Tradition In Action, Letters: Papal Tiara to the U.N.? Why was the tiara and ring not placed in the Vatican museum ,and its monetary value donated to the poor .there is a much deeper meaning to these items been surrendered to the United Nations,when you consider the speech he made ,that mankind must look to the United Nations for peace instead of Christ the King of Peace .A lot more than a tiara and ring was surrendered on that day. Yes, Mazara, exactly it was the open surrender of what had been the powers of the papacy and the Church to the powers of this world. This is why Paul VI opened his speech to the United nations with the quote "Now is the day which WE have awaited for centuries" and then kept repeating his masonic amens "So mote it be" to identify himself as a major occultist having stolen into the papal throne. This was all documented by William F. Strojie in several of his booklets, particularly in his booklet From Rome to Econe. It was more than symbolic - a literal obeisance to the communist/masonic new world order powers awaiting Antichrist at their Rockefeller donated location in NYC. Let's not forget their freaky Meditation Room with the 2010: A Space Odyssey weird black stone altar thing - their syncretist 'chapel' that every post Vatican II so-called "pope" has gone and "worshipped" in when they've visited the UN - and all of them have called the UN, from Paul VI onwards, the "world's last hope" instead of Our Lord Jesus Christ. Really, it's mind blowing and incredible how the antipope supporters continue to stick up for these guys knowing these FACTS but they cannot bear to think that Christ has allowed the papal throne to be usurped this long and by those who have done so - never mind that the true leaders of His Church in His Day condemned Him to death then - and as far as I am concerned Ratzinger and Bergoglio are merely the present day descendants of Annas and Caiaphas. Dont think this patron saint of homos ditched his boyfriend (also named Paul) did he? Yes the hairdresser in the Audrey Hepburn flick Roman Holiday. Didn't Franco Bellegrandi confirm that? Thank you for reporting about the United Nations! Want to know where did the crisis in the church come from? Look no further than the United Nations who by the way covertly favor the Jews. I really recommend Joan Veon´s writings, books and videos about the United Nations which she called “One World Government” that is already in place. U Thant to whom Paul VI. gave his tiara was a devout buddhist. And U Thant praised Vladimir I. Lenin as a political leader whose ideals were reflected in the UN Charta. The modern Popes are humbler than Christ. He allowed His enemies to Crown Him King but the humbler than Jesus Popes will not allow even their friends to crown them a king. But this is not about humility is it? It is about fear of being mocked - like Jesus was mocked. Modern Popes know they would be mocked if they allowed themselves to be crowned because the world rejects their three-fold authority; of course, they reject it too, don't they? Thus, we have the modern Popes genuflecting before the world to gain its approval. What's that? The world is our permanent enemy? How can the title of this article be "Blessed" Paul VI when it is patently obvious that a liberal modernist could never be beatified let alone CONanised? Pope St Pius X made it plainly obvious they are at enmity with The Roman Catholic Church which Montini clearly was. Exactly Leon but that is why CMJ used the quotes around that word, I'm certain. 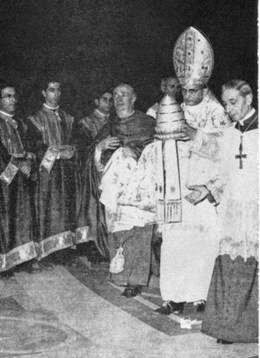 The thought occurs to me that perhaps one reason why Our Lord had Paul VI 'surrender" the tiara to the worldly powers was not only to clue those who weren't completely asleep at the wheel and/or completely zombified by Vatican II 'changes" that he was surrendering to the communist/masonic NWO, but also to clearly signify that as a non Catholic occultist and freemason (If his "so mote it bes" at the UN can clearly denote him as such) he was unfit to wear it in the first place - and the fact that the rest of the antipope bunch has refused to wear it and also refused the coronation oath are more glaring red flags and clues that they are also unfit to wear it - maybe like the witch in the Wizard of Oz they would start melting if they attempted to wear it like when Dorothy threw the water on her? Just kidding, but one can always dream, right? Haha! We can only imagine the possibility and pray it were true. The ridiculous venom of many commentators on sites like these (not the fault of the blog author) is astonishing. Venom matched by arrogance and ignorance. Paul VI was a deeply intellectual pope. He was liberal only in a modern political science sense of the term. He believed in freedom of conscience, against the auto-da-fe (burn them all. Let God sort them out) attitude that says "error has no rights". If you think he was a liberal, talk to any of the many "retired" Catholics who think of him as the icon of conservatism that made them leave the church -- as a result of Humanae Vitae. He was a faithful Christian realist. He understood that the church was now in the modern world. With an exception or two, Catholic monarchies had disappeared a century or more before. The surviving, thriving monarchies had long since repudiated Rome: UK, Sweden, Norway, Netherlands, Denmark -- all Protestant. To pretend to be the prince of European princes would be comical. And what would it mean to anyone in the places where he knew the church was growing -- Africa and Asia? I remember when he gave his tiara as a gift to the poor of the world. It made a big impact. Abdication of authority? Get serious. You are reading your own disgruntlement into the gesture. Of course it was a gesture of humility -- like Jesus washing a questionable woman's feet. This was especially important because he did it after celebrating the Byzantine liturgy. If he was sending a signal to anyone, it was to the eastern patriarchs, who resented the "first among equals" turning himself into the Roman emperor. Auction? Nonsense. What eventually happened was that Cardinal Spellman bought it and brought it to the US. "... it was a gesture of humility -- like Jesus washing a questionable woman's feet." What the hell bible is this clown reading from? A liberal troll it is that extols the virtues of Paul VI. This is a great piece that explains much if not all there is to know about the Novus Ordo robber church. Thank you....I was once blind but now I see. A surfing priest and the "New Evangelization"
Sister Cristina and the "New Evangelization"
Being in a state of grace is now a sin! Francis the modernist invents a new insult!